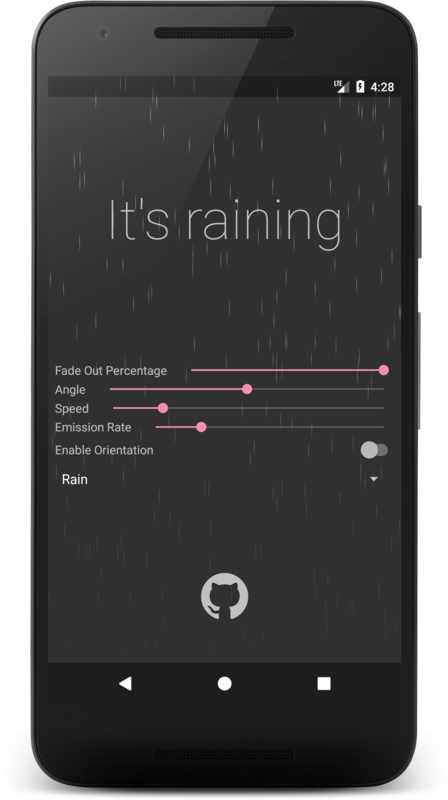 WeatherView is an Android Library that helps you make a cool weather animation for your app. This library is based on the confetti library. For examples of usage, see the demo app. The library moved from the Leonids particle library to the Confetti library, so all methods have changed. The project is also written with Kotlin, so users with Kotlin can use Kotlin-specific features such as property access instead of setX(...)/getX(...) methods. The demo app's minimum API level is now 16, but the library itself still supports API 14 and up. Users that want more control over the particles can access the ConfettiManager instance and customize further, but the WeatherView has sensible default values for rain and snow. The WeatherView also enables users to specify a speed and angle rather than an x- and y-velocity. Since the modification exposed, now is possible to have more control of each single parameter. In the older version, the developer could set only the paramenter of the playing or setted animation. Please take a look to the wiki to discover more configuration options.